Movement is key when making sustained instruments, and this is where Phoenix excels. The unique LFO engine allows easy modulation of virtually any parameter. The shape of this oscillation can be drawn by you and the results are actually shown on the control that you have chosen (such as cutoff frequency or layer 3 volume). Up to 4 parameters can be modulated at once.The second page of Phoenix is the FrozenPlain Effects Engine v2.0, this contains 13 effects such as reverb, phaser, chorus, echo and more. Though powerful, Phoenix can be light on your CPU and RAM. For example, each effect will be bypassed when not in use. You have the ability to purge unused samples from RAM by shift-clicking on the activate buttons on each layer. 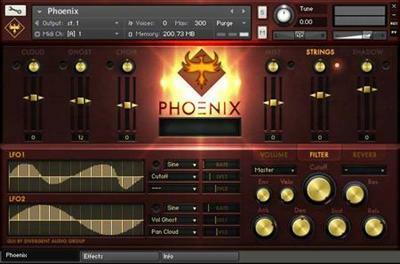 The UI for Phoenix is very simple, and to get you started are 12 presets.